Matt + Clare got married this past weekend on her mother's farm in Dillsburg, PA and boy was it special. One of my favorite parts of my job is seeing how all my couple's put their unique touch into the big day and these two crushed it in the personal touch department. 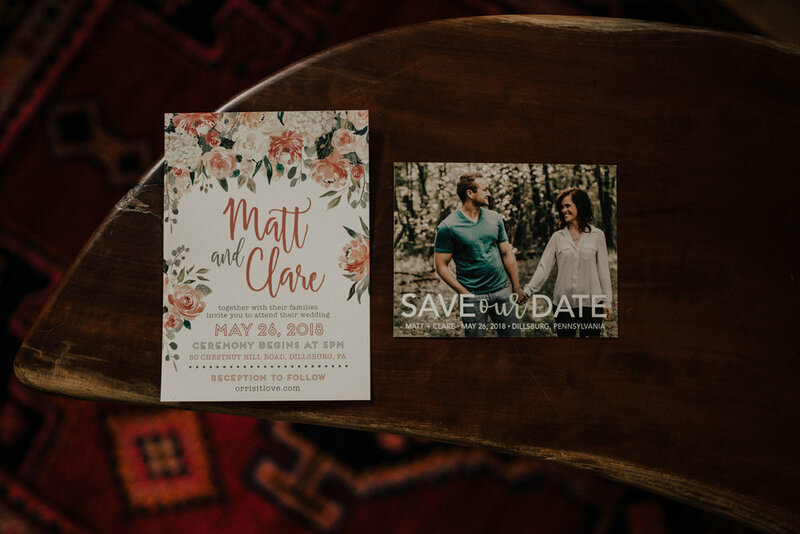 Matt + Clare, with the help of their families of course, have spent the past year and a half - yes, a year and a half, working tirelessly to make the barn and property their dream venue. Even the wooden tables + benches were all made by hand specifically for their day. I love it! Jonathan and I arrived on the farm early afternoon and were immediately greeted by friendly faces and special people who were extremely excited to get Matt + Clare hitched. We were too! The girls got ready downstairs and spent the whole time giggling. They picked wildflowers growing on the farm to use as the finishing touches to their hair. The guys were upstairs relaxing and getting ready, perhaps sneaking in a pre-ceremony shot. They had a beautiful ceremony in the barn and then headed over to the tent for the party! Right before dinner the skies opened up to a torrential downpour. The winds were picking up and knocking things over and the rain was soaking tables inside the tent, but with a little sense of humor from their guests, the party continued. The DJ threw on It's Raining Men and Umbrella to lighten the mood. Everyone was having a blast out on the dance floor. We even ended up with a baby rainbow! The speeches were both hilarious and heart felt. We snuck away for some portraits with Clare's horses which was really special. They spent the rest of the night dancing, playing yard games + beer pong, and enjoying their first hours as husband + wife with their closest loved ones. It was such an honor to be a part of Matt + Clare's wedding day. They are both genuine, kind people and I feel blessed to have captured this day for them.